Chai tea concentrate: an aromatic blend of herbs, spices, fruit and tea ready to mix with your favorite kind of milk for a hot or cold chai tea latte. I have become a tea drinker over the past few years. It started on a vacation to the British Virgin Islands a few years ago. On said vacation, I was actually getting a ridiculous amount of sleep and feeling very well rested (this is pretty much the goal of any of my vacations). Which meant that I was not craving wake-me-the-hell-up coffee every morning. And, since it was the British Virgin Islands, I decided to be queenly and have a pot of tea with breakfast instead of coffee. And it stuck. I'm now a morning tea drinker. Not so much of an afternoon tea drinker, though. Not even herbal teas. Until last month. What happened last month, you ask? I went to a local food swap and scored a jar of spiced chai, courtesy of fellow food swapper Lisa Barnes of Fiddleheads Cuisine (you've got to love a food swap with a professional chef!). It was just the right blend of spiciness, sweetness and floral notes -- perfect for an afternoon pick-me-up that doesn't pick-me-up quite as much as a cup of coffee, which would wind up preventing me from sleeping at night. Lisa was kind enough to share her recipe with me, which I have adapted slightly for you. 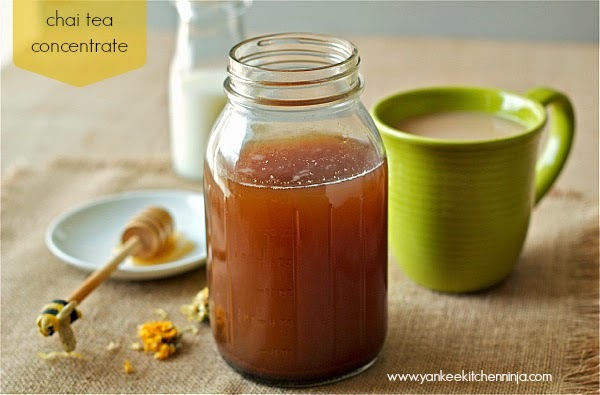 The key is to make the chai in concentrate form, which you can store in the fridge for several weeks. Just mix the chai tea concentrate with your favorite kind of milk -- whole, coconut, almond, half-and-half -- I've tried them all and they're all super, each imparting a slightly different taste, depending on your mood. Voila: an easy, DIY chai tea latte, which you can enjoy hot or iced. One of the great things about this concentrate recipe is that you can begin to customize it for yourself. Try less or a different kind of citrus zest. Perhaps you'd prefer stronger black pepper to mild white. No calendula flowers in your area? Simply omit them. Try green or white tea instead of black. Or make the whole kit-and-caboodle decaf. The choice is yours: Enjoy! Are you a tea drinker? What's your favorite? Leave a comment: The Ninj wants to know. As written, this recipe makes about a quart of concentrate. Combine the first 11 ingredients (water through salt) in a pot and bring to a boil over high heat. Reduce the heat and simmer for 15-20 minutes. Remove the pot from the heat and add the tea leaves. 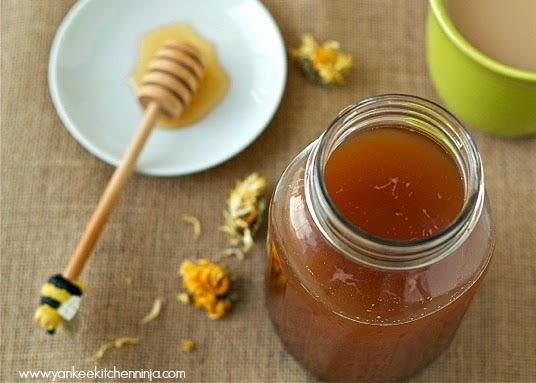 Let the tea mixture steep for 3-5 minutes, then strain the liquid into a bottle or jar (a one-quart Mason jar works perfectly). Stir in the vanilla and honey. Cool and store in the refrigerator. To serve, shake the container and then mix concentrate with water (for straight-up chai) or your favorite kind of milk (for a chai tea latte) in a mug and heat or in a glass over ice for iced chai. What a great idea! I am definitely a tea drinker...mostly peppermint and white tea but on occasion I enjoy chai. I am really loving this idea especially because it would be a really quick way to make iced chai in the summer. Thanks!!! You could definitely make it with white tea, as well! I'm a chai tea drinker who got hooked on it a few years ago. Never looking back to coffee! Then you take the concentrate and mix it with cream and whatnot, freeze it, and it makes *amazing* ice cream. One of my favorites (next to the ginger/lemon/lime sorbet). WHAT????!!! That is friggin' GENIUS! I just made chia concentrate for our swap last week! Nice! Where do you swap, Casey?